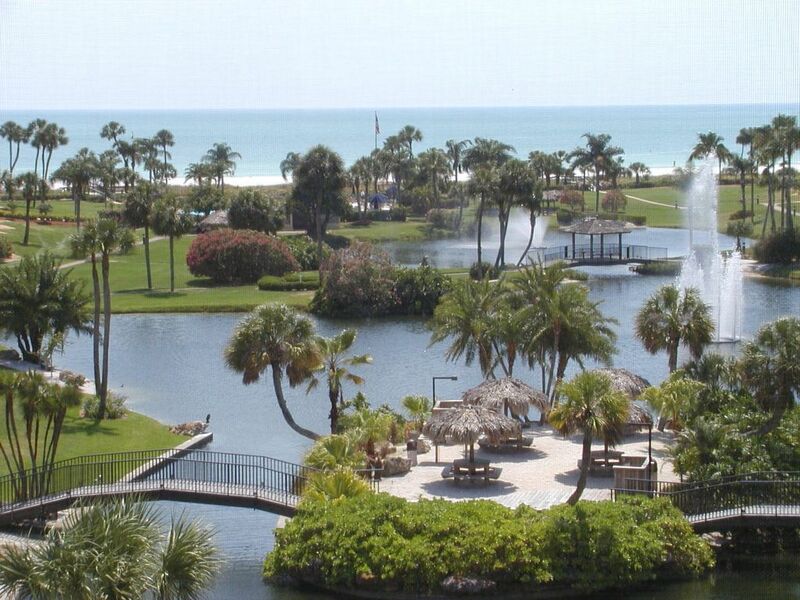 Gulf & Bay Club - E Building - Ground Floor Walkout - Beach-Pools-Convenience! Main level beachfront building walk right out your door to the beach, pool, BBQ Grills, picnic areas, lakes... feels like your own beach house with all resort amenities included... Our Beach Resort is located at the exact center of one of the finest, white sand beaches in the world, our beach resort offers the ideal destination for you and your family. With 3 heated swimming pools, 8 tennis courts, a health-fitness center, saunas, hot tub, racquetball, shuffle courts, social activities, and much more... we think you will agree it is the most perfect spot on the beach. Whether you are looking for laid-back relaxation, action filled sports participation, shopping at nearby St. Armands Circle, or enjoying the cultural activities and fine restaurants of the Sarasota area, you will find it all available to you here. FISHING: If you like to fish, you will find nearly 1,000 species of saltwater fish in our waters that will give you the fishing challenge of a lifetime including barracuda, black drum, grouper, pompano, snapper and tarpon, with year-round on-shore and off-shore fishing. Try deep-sea fishing, bridge fishing, or surf-casting. There are many types . Fish maps and charts are sold on the Key that will provide you with detailed information on the best times, locations, licenses, and limits for fishing. Whatever your recreational or sports inclination, you will find it here. AREA ATTRACTIONS: Sarasota area attractions appeal to a wide variety of tastes and interests. Kitchen renovated with granite counters & stainless appliances. 1 king bed, 2 double beds, 1 sleep sofa. 1 child's cot. Whirlpool tub, fitness room; lighted tennis courts, racquetball; basketball; shuffle court; lakes; picnic area; social club, clubhouse. World's best beach, 3 heated pools, gas grills, picnic tables. Fun in the Sun is what Siesta Key is all about. If you are interested in watersports, you will find fishing, boating, kayaking, dolphin watch tours, sunset cruises and parasailing available. If you are a golfer, there are many golf courses on the mainland. Perhaps you will join our weekly golfing group from our resort. For tennis enthusiasts, our lighted courts await you. During season, an on-site pro is available for lessons, and the ball machine always provides a consistent practice partner. There is also a bowling alley close by. Many people enjoy bicycling and rollerblading through our quaint village or taking in our spectacular sunsets with a stroll on the beach. Golf: If you are a golfer, there are many golf courses on the mainland. Perhaps you will join our weekly golfing group from our resort. Ski: Tennis and Other Sports -- For tennis enthusiasts, our lighted courts await you. During season, an on-site pro is available for lessons, and the ball machine always provides a consistent practice partner. There is also a bowling alley close by. Many people enjoy bicycling and rollerblading through our quaint village or taking in our spectacular sunsets with a stroll on the beach. Rentals for less than six months subject to state / county taxes totaling 12% , Guests at Gulf & Bay Club pay a $100.00 non-refundable application fee. Fully refundable security collected on all rentals.Guests utilizing credit card payments will pay 3% service fee.